“The Natural Environment Research Council (NERC) funds my PhD in marine biogeochemistry, which my friends like to call ‘oceans and potions’. The title of my project is ‘the relationship between iron, copper and humic substances’. Microscopic plants in the ocean, called phytoplankton, are the base of the marine food chain and provide up to 40% of the oxygen we breathe. As phytoplankton grow, they take in carbon dioxide. Dead cells sink to the bottom of the ocean where the carbon is buried and stored. Iron and copper are both important micronutrients for these plants and are found dissolved at very low concentrations in the ocean. Although copper is a nutrient, in certain forms it is toxic to microscopic organisms, hence why copper is used as an antifouling agent on ships and marine infrastructure. Copper occurs naturally, but increased concentrations in some regions are thought to be linked to pollution from these copper-based paints. Iron enters the ocean from rivers, sediments, underwater volcanoes and atmospheric dust (e.g. dust blown from the Sahara desert). But iron is not very soluble and quickly sinks. 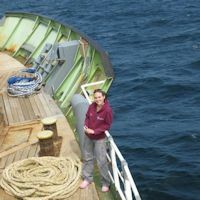 Because of this, phytoplankton growth in vast regions of the ocean is limited by a lack of iron, so much so that enrichment experiments involving the addition of iron to the oceans as a fertiliser have been performed with mixed results. 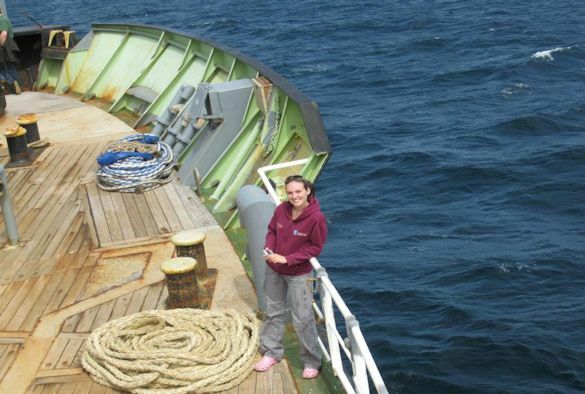 The aim of these experiments was to see if increasing ocean productivity could potentially help to mitigate climate change. Although iron is highly insoluble, when it binds with ligands (organic material also present in seawater) it can remain dissolved and therefore available to phytoplankton. In addition, copper bound to such ligands is far less toxic to phytoplankton than free copper. Humic substances, organic material from soils (humus) and marine debris, are an example of these important iron- and copper-binding ligands in estuaries and may also be important in the open ocean. During my PhD, I have developed a novel method for measuring copper-binding humic substances. On samples from the Mersey Estuary we demonstrated that copper actively competes with iron for the same important ligands within humic substances. By displacing the iron bound to the humic ligands and causing it to precipitate, we found that the presence of copper can lower the amount of dissolved iron available for phytoplankton to take up. Since copper paints are used globally on marine infrastructure and vessels, it is crucial to fully understand the role it plays in the iron cycle and thus in the wider carbon cycle. I am now attempting to identify other ligands that bind copper, by measuring a range of samples from estuaries to the open ocean, and from algal cultures grown in Canada.